Teachers have to do homework. Good teachers do at any rate. Lessons and samples don’t make themselves (and that’s not even getting into grading papers and such). Yep teachers have to do homework before they can teach. Sometimes I think they have more homework than the students. I’ve been pushing the “learning something new!” plan both here on the blog and in my person-to-person life. If that’s been getting old I’m happy to tell you that I’m done… until next New Year. 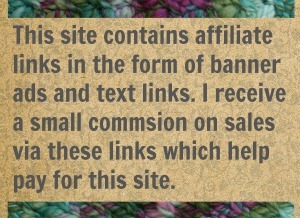 I got it out of my system with the learn to knit for crocheters post and the learn to crochet for knitters post. Along the way there was also a learn new stitches by making washcloths post and that turned into homework for me. I knew it would. 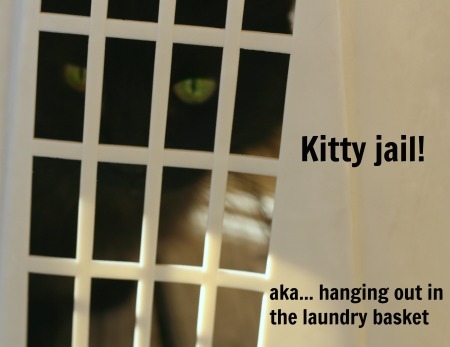 I knew I’d have to make up some of those washcloths. That’s okay. 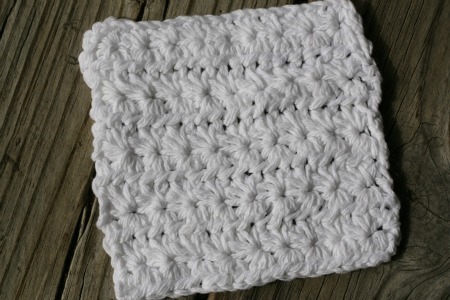 I like making washcloths. And after I’ve used them to teach students new stitches, I get to keep them! This is the kind of teacher-homework that is much more useful than say, a sheet of pre-worked math problems. So I made up a Ballband washcloth because (as my friend Oldcrazyhooks likes to say) its the gateway drug to knitted colorwork. Who doesn’t want to make these? 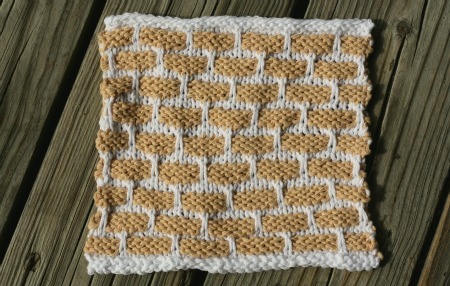 Then I whipped up a washcloth in star stitch. 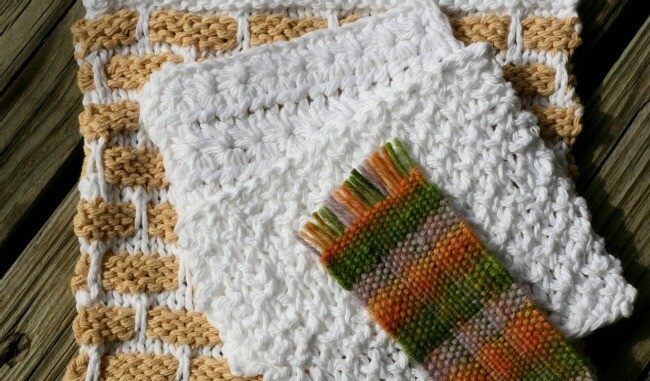 Every Most crocheters likes star stitch and once you can make this rather basic variety, you can dive right into all the variations out there. Its the kind of stitch that causes some head scratching if you are working from written directions but once you actually see it worked, you get it. Yep, star stitch is perfect for an in-person lesson. Then I had to make a bee stitch washcloth. No one has expressed any interest in learning this one (maybe because its so darn easy they don’t need me) but I love bee stitch. I just wanted to make one. So that’s my teacher-homework and its done and I feel pretty good about that. But I wasn’t just pushing the “learn something new plan!” on all of ya’ll. I wanted to learn something new myself and that something was weaving. The other toy/loom is just a glorified version of the cardboard looms you can make right at home and it was right where I thought it would be (in the drawer of hand-washed, hand-carded alpaca batts my mom gave me years ago that I really need to spin someday). What a nice surprise. And… it was already warped with a little project started. What a very nice surprise. I have no memory of starting this… bookmark? So then I thought “Instead of setting up the back-strap loom I should finish the weaving project from a decade ago.” That sounded like the voice of common sense so I went with that plan. Guess what? I’m not very good at weaving. Instead of using fabric scraps or thick waste yarn, I had stabilized the top of this bookmark with three strips of kleenex. Yep, that’s ten-year old kleenex up there (how classy is that?) and it doesn’t work so great. To make matters worse, I warped this little baby with the same yarn as I was weft-ing: a nice soft wool. 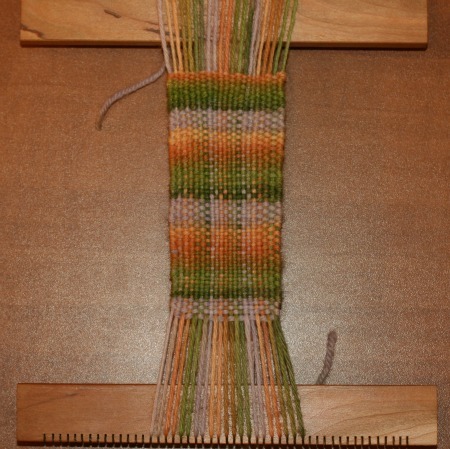 The more I weft-ed, the more stretched out and loose my warps became. Also, my tension is pretty crappy. So in the spirit of leading by example, here is my bookmark. I’ll show it off to the world even though it looks like the kind of weaving you’d expect from a 7 year old. b) I have about as much experience weaving as you would expect from a 7 year old. So I’m right on track with where I should be. Also I know exactly how to become a better weaver: don’t wait ten years to start my next weaving project. 17 Comments on "On Teaching and Learning Yarn-y Stuff"
As a non weaver with no interest in learning that bookmark looks pretty darned good. Thank you for making me feel better about my knitting! After 30 years crocheting and 3 MONTHS on and off knitting, I feel pretty good about the 2 squares I have completed (out of 8 for a pillow cover). 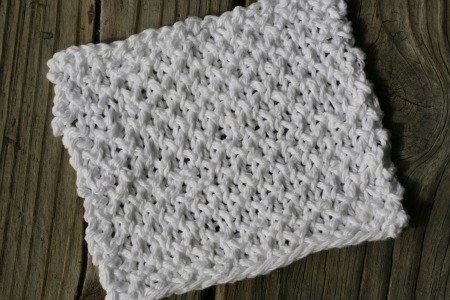 I’m casting on for a new square today called ‘mistake stitch’. You always give me the boost of encouragement I need. Thanks and keep up that weaving. Your colors are great. You’d never know it’s a bit off kilter…the bit sticking out of the book looks fine! She laughs now and still uses them to hold her tapestry needles-kindle has eliminated to original purpose. For a newbie, it’s a really quick project….if you don’t wait 10 years to finish? Yes. Exactly. The crocked edges can be excused. The ten-year time frame… not so much. I just need to make a dozen more book marks (or coasters or something) in a month instead of in a lifetime. Good. Bee stitch needs to grow its fan base! I do card weaving (remember the contest last year?) and honestly that doesnt look too bad, it’s easy to fix tension over time 🙂 You;re doing something new and you WILL get better! Those little looms are the hardest to weave on! You did great for your first project.Step number one is to keep your warp threads under even tension, which it looks like you can’t do with that. And when it gets wider and narrower, that’s called draw in, makes sense, right? and that is also difficult to control on a loom that isn’t held under tension. I hope you keep weaving. I think you’d like a Schacht Cricket loom. Lots of fun! Well I did have trouble with those warps the whole way. It made me kind of look forward to trying the back-strap loom. Oh please do a post on back-strap looms! I am curious. I will! 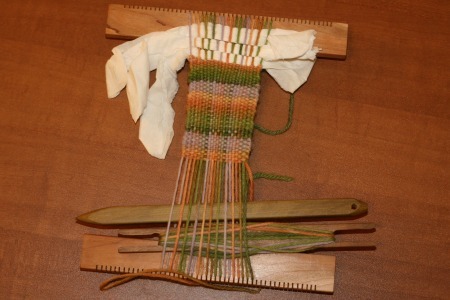 I have to get it set up and going but I’ll be sure to regale teh blog with all my weaving mis-adventures this year.